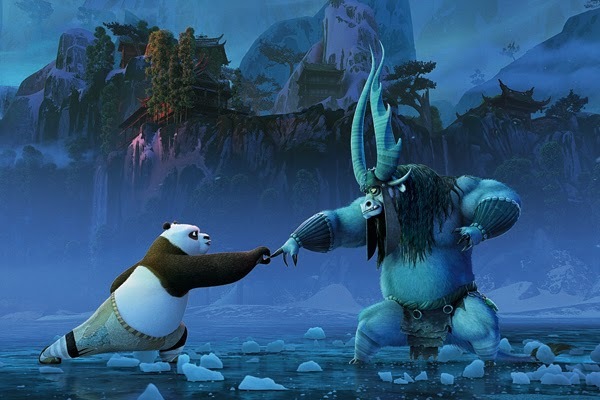 The student is now a teacher in “Kung Fu Panda 3” where Po (voiced by Jack Black), the dragon warrior had been tasked by their master Shifu (Dustin Hoffman) to take on the responsibility of further training the Furious Five. As Po faces the insurmountable challenge of training his idols, the “best of the best” Kung Fu warriors in all of China – Tigress (Angelina Jolie), Monkey (Jackie Chan), Viper (Lucy Liu), Crane (David Cross) and Mantis (Seth Rogen), he then meets his biological father Li Chan who made his way to the Valley of Peace looking for his long lost son. “Kung Fu Panda 3” brings Po in full circle as he continues his evolution as a hero, leaving his comfort zone to become a teacher and finally become the Panda he was meant to be - bringing together his biological family and his kung fu family to become a master of the past and the future. As Po attempts to instruct his idols – Tigress, Monkey, Viper, Crane and Mantis – in the finer points of kung fu, chaos reigns in the Training Hall, a place of discipline, honor and sacred practice. “The Five have become positive and optimistic about their friend Po, but they have serious doubts about his abilities as a teacher. And for good reason!” says Lucy Lui. It is Shifu who first recognized and channeled Po’s passion for kung fu, and, now, once again pushing Po to the next level, insists he become a teacher. “Shifu knows Po must face the challenge of becoming a teacher, but he also knows it’s not going to be easy,” says producer Melissa Cobb. Short of stature and, sometimes, of patience, Shifu is a fun and complex character. Oscar® winner Dustin Hoffman returns to voice the role, to which he brings four decades of experience as one of the world’s great actors, as well as world-class comedy chops. Unlike Shifu, the Furious Five have serious doubts about Po’s ability to teach kung fu. These protectors of the Valley of Peace take their art form very seriously and have always had the best-of-the-best instructor – Shifu – keep a weather eye on them. Now, they have to take instruction…from Po? The victims of Po’s instruction are Monkey (voiced by the legendary Jackie Chan), whose mischievous and playful nature masks a cunning martial arts ability; Crane (David Cross), the pragmatist of the group; Mantis (Seth Rogen), the smallest and most temperamental of the Five; Viper (Lucy Liu), the team’s “mother hen”; and Tigress, the strongest and boldest of the Furious Five. “Kung Fu Panda 3” opens March 9 in cinemas (2D, 3D and IMAX 3D) nationwide from 20th Century Fox to be distributed by Warner Bros.